Going, going, gone! 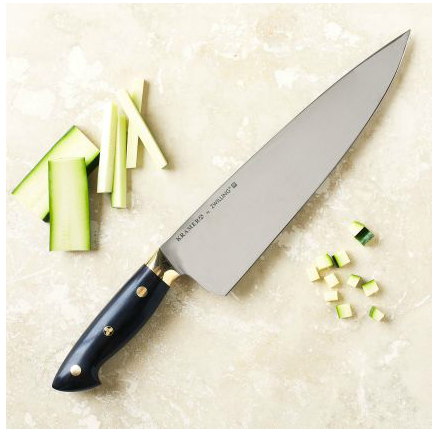 Kramer Knives just auctioned off another one of Bob’s beauties the other night—a 10-inch European style chef knife. In case you’re a newbie to the world of custom-made kitchen knives, Bob Kramer’s been one of its most distinguished and apostles for the past decade or so. 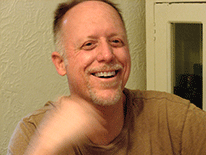 Ever since he became a Master Bladesmith (a subject unto itself) and hung out his shingle in the green Northwest as a most passionate and gifted knife maker. The thing is—not only is this knife a work of art, but it works. It belongs in the elite cadre of some of the most wicked (and resilient) kitchen cutting machines on the planet. It will slice through 1-inch thick braided rope with a single thwack. It will hack through not one, but two, two-by-fours, without chipping or bending, and after all that, still shave the hair off your arm. I am not exaggerating. Beauty and functionality in one body. Not that anybody will probably ever use it to cut a single carrot. But that’s OK. It’s awe-inspiring to know that the cutting power is still there. And finally. . .the answer to the question you had from the top of this article. . .what did it go for? A cool $32,200. (Yes, you saw that right.) Sure, that’s a bit rarified, but Kramer’s now a celeb, and this knife is not his standard fair. It’s entered into the status of objet d’art. (Plus, if it makes you feel any better, ten percent of the sale is donated to a very worthy charity.) Bob still custom forges plenty of other Kramer knives that go for a mere six grand, which is still a lot, but at least not the price of a car. Now . . . if you want to drop down out of the stratosphere and find something quite a bit more affordable, you should consider Kramer’s factory-made model, designed in league with Henckels. At a measly $300 (everything’s relative, isn’t it? ), it feels like a steal. Yet it has many of the same features and styling of its arty cousin—high quality steel; thin, but extra-wide blade; perfect balance—and, believe it or not, it should be just about as sharp. My favorite professional sharpening service swears it’s “the best knife in the world.” Maybe a blast of intentional hype—but I think there’s something behind it. For the serious aficionado, it’s worth a serious look. P.S. If you’d like more details on the Kramer knives made with Henckels, see my article Bob Kramer Knives — Why Spend $300 on a Chef Knife? 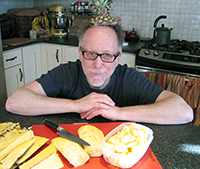 For more tips on kitchen knives, check out my latest interview on Cilantro.com. Wow…had no idea knives could be worth that much! incredible piece of artwork, what is damascene? 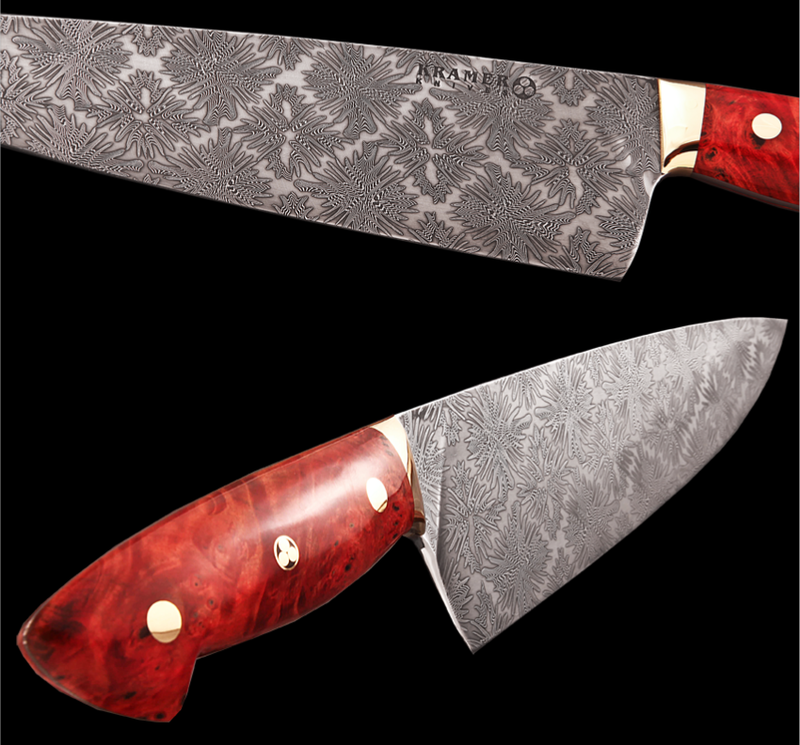 “Damascene” blades are the blades Kramer makes using the damascus steel process—an age-old technique of layering different types of steel, pounding them together, and folding them over themselves repeatedly to create a uniquely strong and beautifully patterned blade. Read and see more on his website: http://kramerknives.com/damascus/. Thanks, Danny. . .great clip! Hello! My brother gave me a Bob Kramer 10″ chef 18 years ago on my 30th birthday—pre Zwilling/Henckels, etc.—he actually called and could speak to Bob on the phone back then. I emailed Kramer Knives recently and they found the record of the purchase on their books. I am having them recondition/service it as it was with my ex-wife for a few years and she used like any other knife in the drawer (!). They said they will send it back with an authenticity certificate. Any idea of the knife’s value? Thanks for any input. Your knife has some great back story! Made me chuckle. . .
You know I rummaged around the internet for an hour or so and I couldn’t get very far concerning value. Nobody sells original Kramers. The only examples I could find of anybody selling an original Kramer you can see below. But a new original, sold on a lottery, is now, I believe, around 4k or more. And an auctioned blade, as you can see from this post, can go for tens of thousands. So maybe if yours is in premio condition you could get 4k or more. Who knows? Otherwise, just use it and enjoy it and hand it down to your kids. . . Thanks KKG, appreciate your response. Really looking forward to see the knife after they recondition it. It’s back… ;) I’ll post pics if your site allows. Hello, I emailed you a couple of pics. Also, the knife can be viewed on ebay if you are interested. Auction #222509315714. Will see what the market bears. Thanks.